OMEGA 5/32'' low profile removal socket for Hi-Lok®, Hi-Lite®, Eddie-Bolt® Fastener Collars. Patented, -5, 1/4'' Female Square Drive Socket with left-hand tapered internal threads, for removing collars from 5/32'' diameter threaded pins. OMEGA 3/16'' low profile removal socket for Hi-Lok®, Hi-Lite®, Eddie-Bolt® Fastener Collars. Patented 1/4'' Female Square Drive Socket with left-hand tapered internal threads, for removing collars from 3/16'' diameter threaded pins. OMEGA 1/4'' low profile removal socket for Hi-Lok®, Hi-Lite®, Eddie-Bolt® Fastener Collars. Patented 1/4'' Female Square Drive Socket with left-hand tapered internal threads, for removing collars from 1/4'' diameter threaded pins. OMEGA 5/16'' low profile removal socket for Hi-Lok®, Hi-Lite®, Eddie-Bolt® Fastener Collars. Patented 1/4'' Female Square Drive Socket with left-hand tapered internal threads, for removing collars from 5/16'' diameter threaded pins. 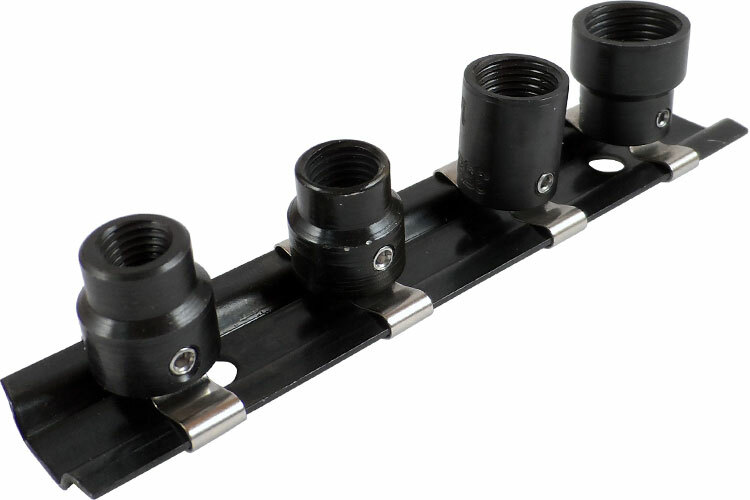 The OMEGA LP3581-4PC Low Profile Collar Removal 4 Piece Socket Set For Hi-Lok And Hi-Lite is one of thousands of quality tooling products available from MRO Tools. Please browse Hi-Lok Collar Removal Sockets for tools similar to the OMEGA LP3581-4PC Low Profile Collar Removal 4 Piece Socket Set For Hi-Lok And Hi-Lite. OMEGA LP3581-4PC Low Profile Collar Removal 4 Piece Socket Set For Hi-Lok And Hi-Lite description summary: OMEGA low profile removal 4 piece socket set for Hi-Lok®, Hi-Lite®, Eddie-Bolt® Fastener Collars Quantity discounts may be available for the OMEGA LP3581-4PC Low Profile Collar Removal 4 Piece Socket Set For Hi-Lok And Hi-Lite. Please contact MRO Tools for details.